Decided to abort an 18h print job cuz 2 hours in and the base is starting to curl. Any thoughts on how to get a better adhesion for ABS? I’m using a filament from IC3D on an Ultimaker 2, heated print bed and 230 degrees extrusion temp. 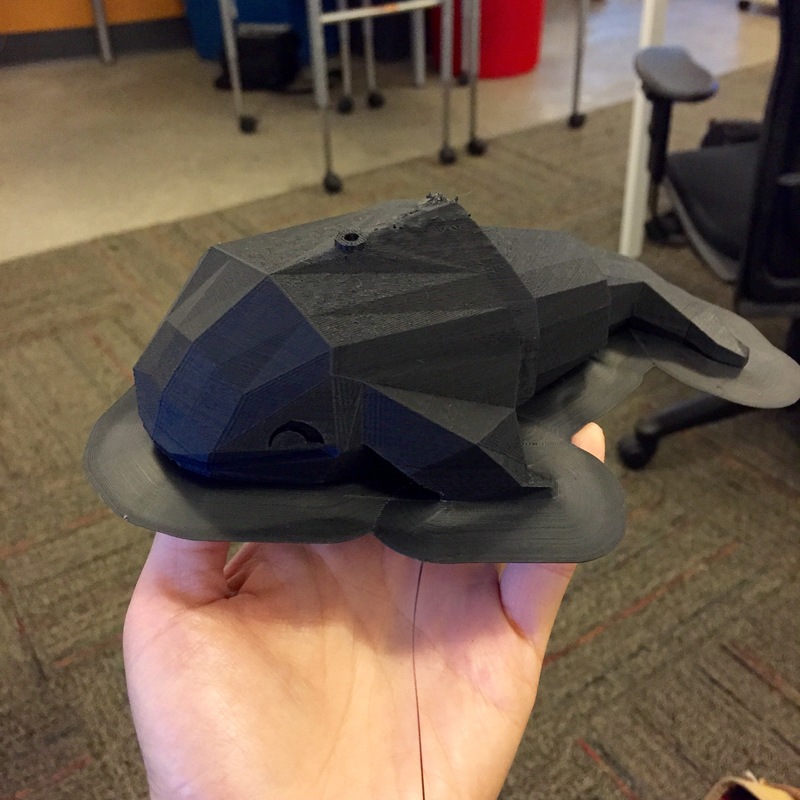 If you are printing on blue tape, have you tried printing with brims or creating mouse ears for the model? Warning: TLTR, possibly confusing, and definitely frustrating. Shrinkage from air-cooling is the problem. Straight line perimeter walls very prone to this. Overhanging perimeter wall, especially corners, are going to be difficult. Blue tape is coated with a sealer, so should be lightly sanded w/240grit, then cleaned w/alcohol. As Tanya suggested, add “ears” to the corners. (they come in different sizes). Cut them off later. Use a Removable glass plate, instead of tape (adjust Z-height home to compensate for glass thickness) Apply "Aquanet Superhold hairspray, 6 light-thin layers for new glass, allow to dry for each application(tip: use hairdryer), then just 1 application for “seasoned” glass(allow to dry). Pop finished print in to the freezer for 2-3min, and the object will remove effortlessly. This only work for me, for objects up to 2-3 inches wide. Modifying the printer, with a Fully-Enclosed build chamber, will help to trap heat and reduce the possibility of warping. big enough to accommodate the cables, (thru all it’s possible movements). - Add a clear acrylic front door. (w/ hairdryer) , while the bed is coming up to operating temperature. How hot was the bed? Print the first couple of layers nice and slow and make sure it is really smooshed down into the tape. 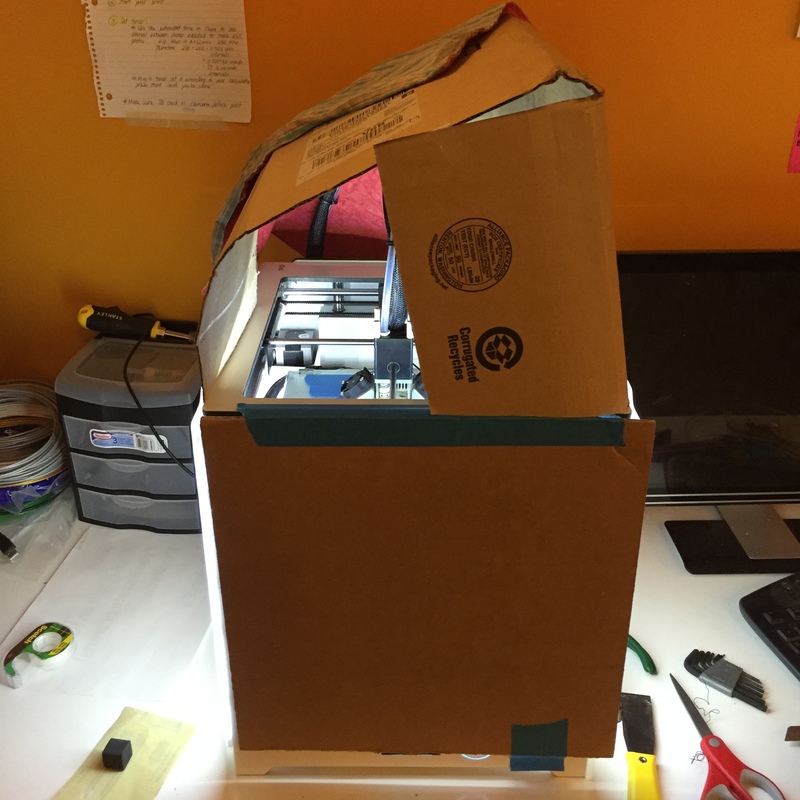 Your printer should be enclosed…At the very least tape a piece of cardboard around the 3 open sides. That should be good enough…the problem I usually have is getting the print off the build platform, it sticks too well…If you have this problem make sure the bed is hot before trying to pull the print off. I tried adding mouse ears, which turns out is not the simple choice since I had to download a design program to do that. 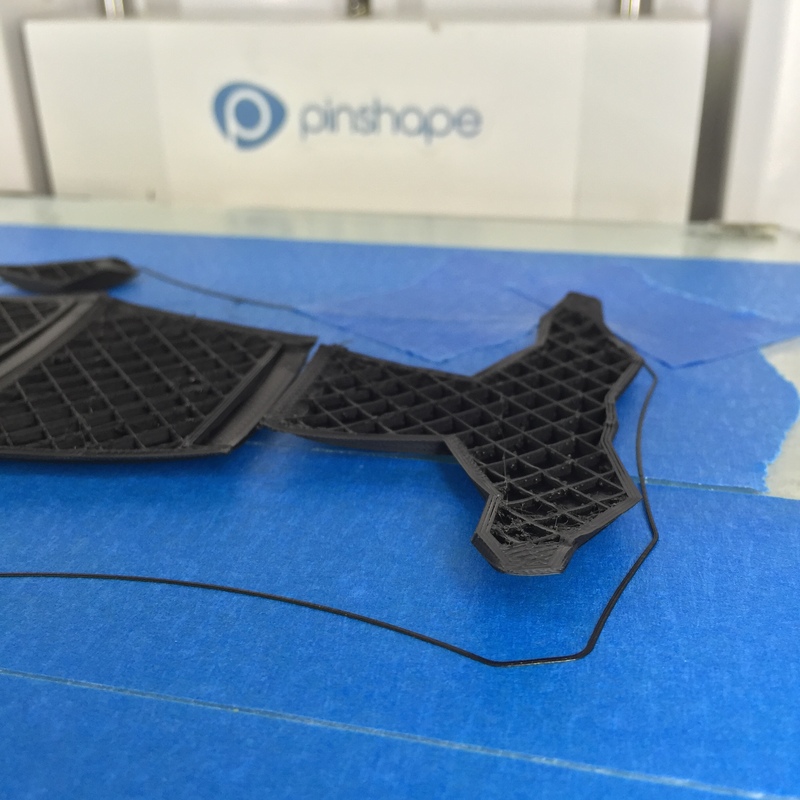 But it didn’t work… lifted off the print bed anyway, the curling force was too strong! I can’t be sure which factor played the biggest role in getting the whale to print. I think the brim helped tremendously, but it could be other factors like reducing the size, etc. Should I be a nerd and reproduce the print with an isolated factor, such as ONLY adding a brim?? Perhaps one day… at 200% this whale would have taken 18+ hours. Ah well! Time to clean up the print and maybe do some sanding and painting! Nice job! Clever quick-fab DIY enclosure, as you may have noticed, doesn’t have to be airtight, mostly just keeps light breezes from entering, and trapping a little extra heat is just a bonus to help. My first quick-fab was just clear wide-packing tape, it worked fine for months, but removal from the machine surface was not fun, doh!. I forgot to mention “BuildTak”, as a bluetape replacement. It holds better than bluetape, but makes removal a little more difficult. Balancing “Stick vs Removal”, is why there is so many different approaches. It kinda depends on what filament material you are going to use, and which machine you’re using. Print bed Fans can be completely turned-off, for ABS. Unless they are also working to cool the hotend, on the U2, so reducing fan-speed would be fine. Tip for painting: Primer for prepping ABS, for acrylic paints: I use spray-cans for priming large objects. It’s fast and fills-in everything. 1 coat “Rust-o-leum 2X, Ultra-cover, for plastic”. 1 coat “Filler-primer”, (@autoparts). then sand that out. If I’m going to airbrush a small object, I stick with specific airbrush primers for their paints. Congrats on your smooth print, challenge conquered ! !